The Catalan government has approved plans to develop the National Pact for the Knowledge Society, which will advance a strategy shared by the university and research system and actors in the productive economy. The aim is to build the Catalonia of the future by laying a solid foundation for the creation of a more knowledge-based society. The Pact will focus on making innovation central to the design of future government policies so that the percentage of knowledge-based economic activity increases to a level comparable to countries that are leading innovators. An initiative of the Catalan Ministry of Business and Knowledge, the Pact is intended to be cross-cutting and consensus-based. It therefore includes mechanisms for interaction between all actors involved in generating, transmitting and applying knowledge, including the higher education system, the research and innovation system, and the social and business fabric. Given the broad scope of the Pact, led by the Ministry of Business and Knowledge, it involves several other Catalan ministries – namely, Education; Health; Agriculture; Economy and Finance; Digital Policy and Public Administration; and Labour. To ensure that it is cross-cutting and consensus-based, the new Pact also has a regional dimension and will include the participation of representatives of the Catalan Association of Municipalities, the Catalan Federation of Municipalities, and administrative territorial jurisdictions known as vegueries. In this way, the Pact also promotes decentralisation and the co-responsibility of Catalan territories in the innovation policies to be developed. The overall goal of National Pact for the Knowledge Society is to make Catalonia a more knowledge-based society that is able to address economic challenges, in terms of competitiveness and employment, as well as social challenges, given the key role of knowledge in determining quality of life. To achieve this, Catalonia must make a leap forward on innovation indicators. According to the European Commission’s Regional Innovation Scoreboard 2017, Catalonia is currently a “Moderate + Innovator”, with a score of 88.5% of the European average. The main mission of the newly established University, Research and Innovation Observatory will be to prepare an annual report on the state of the knowledge society in order to have a clear picture of how Catalonia is doing in this area, and to establish future policies based on international parameters, identified needs and available resources. The mission and vision of the knowledge system. Analyse the mission of the main actors in the knowledge system – universities and research centres – and define its scope to give them the impetus needed to build a strong knowledge-based regional economy. Human resources. Analyse and propose a specific HR model, in both universities and research centres. Economic resources. Take the measures necessary to progressively develop a specific model to support the most disadvantaged students, configure a stable, sustainable model for funding public universities, and provide economic resources for research centres, as well as encouraging the participation of business networks in the definition and application of strategies, especially in the area of regional development. The research system. Identify all the actors in the system and define their roles in order to set objectives and adopt measures aimed at building a system capable of having a global impact. The transfer, innovation and entrepreneurship system. Identify all actors and the role they play, set overall objectives, and establish mechanisms for interaction and follow-up. Research support infrastructure. Generate an infrastructure network with a strategic policy. Interaction between the territory and cities. Make Catalonia’s regions co-responsible in the development of innovation policies by connecting higher education, research and the industrial fabric. In addition to laying a solid foundation for Catalonia’s future, the Pact will also address short- and medium-term challenges such as equity in access to higher education; university funding; the establishment of a specific legal framework for the Catalan research system through the Law on Science; and, based on the Law on Start-ups, Technology and Disruption, the creation of a new legal framework to accelerate and facilitate innovation and entrepreneurship so that start-ups are able to compete internationally. The National Pact for the Knowledge Society will be structured as a plenum, chaired by the president of the Catalan government and composed of a broad range of members representing the government, the higher education system, the research and innovation system, the social and business fabric (political parties, business organisations, trade unions, cultural organisations, etc.) and regional actors. 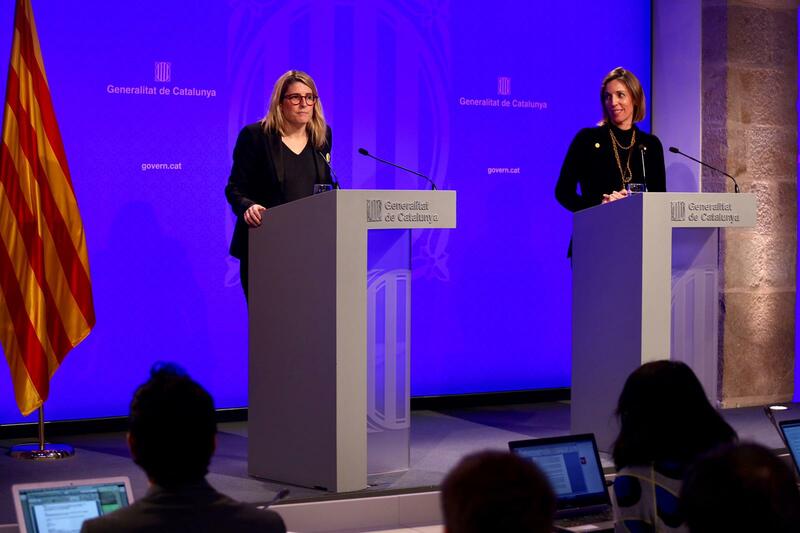 The plenum will meet at least once every six months, and its main functions will be to prepare the final proposal for the Pact and submit it to the competent ministry for approval by the Catalan government, which will then submit it to the Catalan Parliament. The Pact will also have a permanent board, which will be chaired by the Minister of Business and Knowledge and composed of a smaller group of representatives of all the actors involved. This board will meet every two months, and its main function will be to act as a supervisory and coordinating body that organises and oversees the activity of working groups. Both the plenum and the permanent board will be supported by an advisory council composed of up to 40 individuals from the academic, scientific, business, social and cultural spheres (among others) who are not members of the plenum. The final component of the structure will be seven working groups, which will be set up to develop the seven key pillars of the Pact. The working groups will be tasked with proposing specific measures in each area for inclusion in the final text of the Pact. The final text will define the starting point, strategy, actions, timetable for implementation, and the public and private resources to be used, as well as indicators for evaluating achievement of objectives. Following the approval today of the government agreement to establish the Pact, in February, the plenum, the permanent board, the advisory council and the seven working groups will be formed. Between now and June, meetings will be held to develop proposals for inclusion in the final text, which is expected to be completed in September of this year. After these nine months of work on the project, it is anticipated that the Pact will be implemented in 2020–21.